Vegetarians and vegans have traditionally made up about 15 percent of the American population, and that number doesn’t really change very much. What has changed in recent years is the number of people who identify as flexitarian, those who cut back on animal-based products and substitute plant-based ones to a certain extent. As more people are choosing foods based on plants, the demand for creamy, great-tasting dairy alternatives continues to grow. 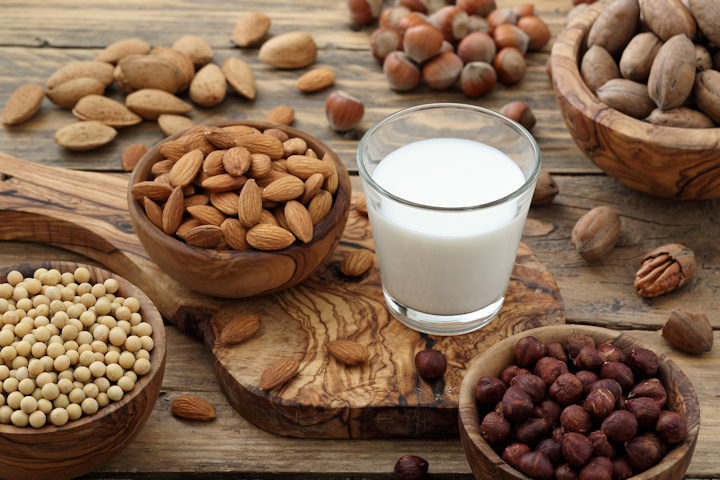 Almond milk is one traditional plant-based dairy alternative that’s taken the mainstream by storm, but it’s not the only one. These alternatives to traditional dairy foods are becoming everyday favorites in homes across the country. When most people think dairy, the first thing that comes to mind is milk. If you miss having a cold, creamy glass of milk with certain foods, you’ve got dozens of alternatives to choose from. The closest in flavor to dairy milk might be traditional almond milk, but a quick look in today’s grocery shelves will show up to 20 different types to choose from, including cashew, coconut, rice and flax milk. While the wide variety of nut milk flavors is encouraging, some people are put off by the long list of chemicals in some commercial brands. Fortunately, making your own nut milk is one of the simplest kitchen tasks you can do. Soak nuts for eight hours, blend them with water, strain the results into a pitcher and chill. That’s all it takes for a quart of creamy nut milk in any flavor you like. Some high-end companies are beginning to offer dairy-free butter, but most people have grown up with at least some familiarity with this concept. If your parents used margarine instead of butter at the dinner table, you’ve been eating vegetarian butter all along. This is one area where mainstream manufacturers have pretty much perfected the non-dairy alternative to a dairy product. Decades ago, non-dairy vegan cheese was a laughingstock: plastic flavor, refusal to melt and rubbery feel. Today’s vegan cheese alternatives are a mixed lot, with the slices and blocks being your best bet. Vegan cheese shreds still haven’t been perfected for the ideal meltiness on your pizza, but many slices have, for some reason. Some soy milk alternatives to dairy coffee creamer exist, but it makes no sense to buy them since the homemade versions are so easy to create. Use the same method as you would for nut milk, just using less water, and add a drop of vanilla, a bit of agave or a little bit of cinnamon to add a touch of flavor. Is there anything as decadent as piling fluffy clouds of whipped cream onto a sweet dessert? Even plain berries become a gourmet treat when you add this sweet topping. A vegan variation of whipped cream can result in piles of white fluff. All you need is coconut milk, confectioner’s sugar, and a mixer. Take that dessert one step further and add some dairy-free ice cream. Today’s demand for alternative recipes has encouraged major ice cream manufacturers like Ben and Jerry’s and Haagen Dazs to create dairy-free alternative flavors that taste every bit as good as their dairy varieties. If you’ve chosen to live a plant-based lifestyle, what’s your favorite dairy alternative? Do you make any varieties yourself? Good article. Your vegetarian %s are off a bit. According to the Vegetarian Resource Group, about 3.2% of adult Americans are vegetarian: https://www.vrg.org/nutshell/Polls/2016_adults_veg.htm . A much larger % of Americans are flexitarian, as your article states. This is great news, as it has motivated mainstream companies to offer veg options – even Carl’s Jr. has a vegan burger! Things are improving greatly.